You came to terms with the diagnosis of breast cancer, which was likely the most difficult thing you’ve ever faced in your life. Chemotherapy was exhausting emotionally and physically, but during this time, you found an inner warrior princess you never knew existed. Now you are dealing with hair growing back in, perhaps with a texture and color different than the locks you grew accustomed to all those years. It may even resemble “peach fuzz” baby hair, an adorable trait in babies, but not necessarily one you cherish. Any hereditary or genetic hair growth patterns (e.g. a widow’s peak or double crown) tend to be the same as before. Creating the ideal hairstyle after chemo may feel daunting, but with a little creativity and the right products, it is doable and can even be enjoyable. As soon as a little bit of hair has grown in, you can begin to "part" it. A part is innately feminine in nature and masks the masculinity of the shorter crop hairdo. You may need to use hair paste to help define where you want the part. This little touch adds a flair to hair you might find frustratingly limited at its shortest stage. Using hair paste can help you define a deep side part. This creates a feminine look that gives new meaning to the word usually associated with balding older men! When hair starts growing back in, it will still be patchy and the center may be longer. Use hair paste to mold the middle into a modified Mohawk with your hands. This is a fun way to add a playful touch to short hair. 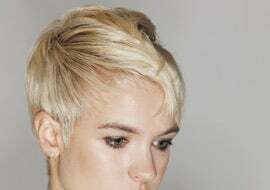 Although a pixie hairdo might not have been on your wish list, some women who have been through chemo end up loving this style so much, they decide to keep it. Learn more about this timeless and popular hairstyle below. Use hair paste, pressing and rubbing it into your hair; Place hairpins wherever bits of unruly curls are sticking up. Use a mini straightener to help tame the little curls in front. Headbands are a great accessory to add panache to this simple style. Look for headbands with thin sparkly bands to add a little dimension to your hair and dress up your overall look. Many of the world’s most beautiful celebrities rock pixies and look divine – Jennifer Lawrence, Charlize Theron, and Michelle Williams – to name just a few. A dime-size dollop of lightweight wax or pomade adds texture and volume. Blow-dry bangs to the side using a small round brush. For a wispy effect, you can use a flatiron to style face-framing sections, then tousle and separate with your fingers. Simply changing the placement of the part can make a pixie feel new and exciting. Wear the hair tousled on top for a whole new look. We love the ease and versatility of this style. Once chemo is complete, most women discover new hairs sprouting fairly quickly, resulting in sparse visible hair within 2 to 3 weeks. Following treatment, the body may be run down and depleted of nutrients, so hair can take a little longer than normal to grow. The hairline at the front of the head, nape of the neck, and the crown tends to be the slowest growing area. 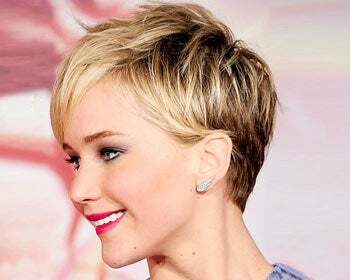 By 2 to 3 months, a majority of women have enough new hair to sport a short crop style, however, it typically takes about 5 to 8 months before hair is long enough to see texture. Take care of your scalp when regrowing hair after chemo by washing your scalp with a mild shampoo. Your oil glands in your scalp are the same whether you have hair or not, and this will keep your wig, hats and scarves cleaner. Some women swear by taking supplements such as Biotin, although there is little scientific evidence vitamins promote hair growth. Others use minoxidil 5% (Rogaine), the only topical medication approved by the FDA for female-pattern hair loss. Check with your doctors before using supplements or minoxidil. Most women recovering from chemo experience hair growth without these remedies, but some feel it gives hair follicles an extra boost. The following hair styling products can be beneficial during hair’s growth phase. You may have to experiment a little to see what works best for your hair texture and at different stages of regrowth. The lovely locks on your head are growing back, but so are your eyelashes and eyebrows, and they look rather sketchy. During the growth stage, eyeliner, mascara, eyebrow wigs, eyebrow stencils, and false eyelashes can help you achieve a dramatic look. The combo of big, bold brows, long fluttery lashes, and a short “do” creates quite a striking fashion statement. 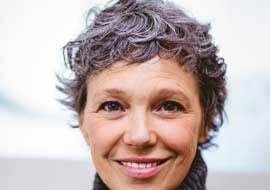 Growing hair out after chemo does not have to be a dreaded experience – with the right tools, a little know how, and creative panache, it can actually be a time to spread your wings. Be bold, brave, and beautiful in your own unique way!